Rosemary Essential Oil - Therapeutic And Fantastic For Skin And Hair Care. Rosemary essential oil, with its warm and penetrating aroma, is one of the most stimulating oils used in aromatherapy. Rosemary was one of the earliest plants to be used in medicine, as well as for cooking and for religious rites. During the middle ages it was used to smoke out devils during exorcism. I often add a couple of drops of rosemary oil to my bath if I'm feeling tired after a days gardening - it is so good for aching muscles! Also great when blended with black pepper as well! It has a very strong antiseptic action so is terrific to use in aromatherapy recipes for cleaning. Rosemary has traditionally been used in skin and hair care for centuries. Works well in an aromatherapy massage blend to relieve stiff and tired muscles. It has a very stimulating effect on the central nervous system, so can be used where there may be temporary loss of smell, or speech impairment. Also useful for people with colds, catarrh sinusitis and even asthma - here it is best used as a steam inhalation. 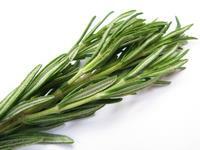 Rosemary helps to lower cholesterol levels in the blood and is good for your heart. A great oil for stimulating dull skin and good for the scalp, especially dandruff or loss of hair. Rosemary is astringent and toning and good for oily or congested skin, especially in the form of an aromatic water. Rosemary essential oil is an emmenogogue so must not be used during pregnancy. It should not be used on people with epilepsy or high blood pressure. It is a reassuring oil which offers strength. The Greeks and Romans saw rosemary as a sacred plant that offered comfort to the living and peace to the dead.